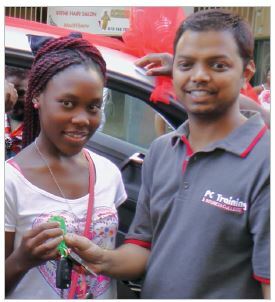 PC Training & Business College is proud to announce its first car winner, Refelwe Rose Mlaudzi (18) in a series of 5 VW Polo Vivo GT give-aways which kicked off in October last year. PC Training & Business College (Pty) Ltd, operates Higher Education and Further Education Campuses located across major cities in South Africa. Higher education qualifications are offered at higher certificate, advanced certificate, diploma and degree levels in the faculties of Information and Communications Technology and Business, Economics & Management Sciences. PC Training & Business College is proud to have been part of the transformation agenda of our democratic government and continues to make its contribution in re-shaping the education, training and skills development landscape of South Africa. Employer endorsements for the many successful graduates placed in permanent employment is our track record. The institution's commitment to the South African education and skills development needs is further demonstrated by its commitment to substantive capital investments not only in the education, training and skills development sector but also in the continued rejuvenation of our major cities' CBDs. The ongoing networking with the ANC's Progressive Business Forum in Durban together with the President of South Africa and other cabinet ministers, premiers and parliamentary portfolio committee members. Acknowledgement by the Deputy President of South Africa of our contribution to the National Human Resource Development Strategy. Being the recipient of the Durban Chamber of Commerce and Industry/Standard Bank Business Entrepreneur, FNB & African Access Nation Business Awards. In January 2012, PC Training and Business College introduced a Telefunken Tablet PC as part of their students' improved learning experience at all 70 of their campuses nationwide, in a move that has changed tertiary education in South Africa. Students have access to e-libraries and pre-loaded learning material empowering them to draw from a wider range of research material. Lectures are recorded and uploaded onto the internet for future reference. PC Training & Business College has a strong development focus which facilitates all staff to have an increased sense of belonging within the Institution. 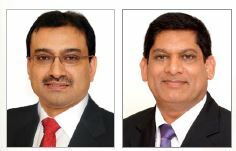 Management ensures that both, time and resources are available for staff development. The institution's commitment to Employment Equity is evident in the institution's shareholding, directorate, senior and middle management positions. "To be a world-class academic Institution in Business, as well as Media, Information and Communications Technology, ensuring incremental quality improvements in Education and Training practices". 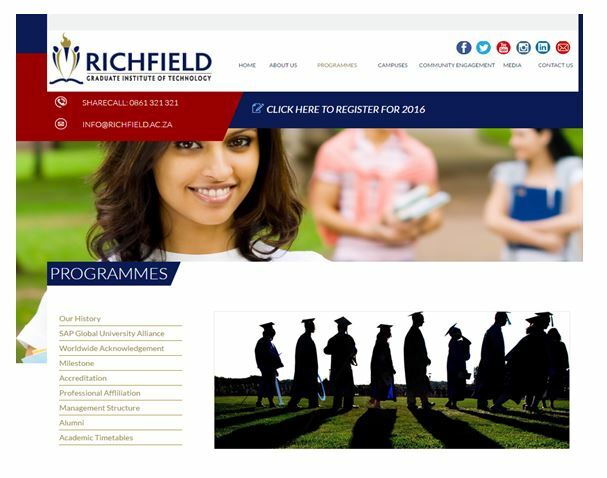 Richfield Graduate Institute of Technology and East Coast Radio are giving away up to half a million rand in bursaries this December!